When a client of mine, Susan, first contacted me for home maintenance help, she was very upset about the state of her kitchen. “The place is a disorganized mess!” she told me, so I immediately set up a consultation to show her how personal concierge services were the solution to her problem. We sat down to discuss her lifestyle and how it affected her home and kitchen. She explained to me that she had 5 children, one of whom was married with a new-born, and visited often. Her husband worked full-time and she found it increasingly difficult to stay on top of her kitchen, which never stayed tidy. Everywhere we looked, there were pots, pans, packets of food, dirty dishes, vases and broken Tupperware – we could barely see the worktops! Her cookbooks were strewn around the floor because she had nowhere else to store them, and there were smelly bins clogging up the entryway. I could see how miserable Susan looked as I assessed the area with her. “I keep having to buy the same products over and over again, because I can never seem to find them in the mess”, she told me! I surveyed all areas of the kitchen, taking note of the spacious pantry and large island with plenty of storage potential. I also measured the pantry shelves for future reference, because I knew they’d come in handy. Once I explained the difference some professional home organizing could make, Susan couldn’t wait to get started! I began Susan’s home maintenance project by creating a 5-step plan that involved decluttering and reorganizing her possessions, as well as some personal shopping that stuck to her budget. We purged plenty of items that Susan didn’t even know she had, let alone needed, throwing away anything broken or out-of-date and donating what she wouldn’t use. 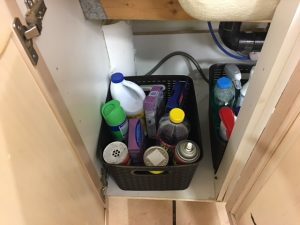 I helped Susan to develop a garbage system and a storage solution, using what she already had or could install herself (she was on a tight budget and adamant about not using a handyman). I explained to Susan that I could also act as her personal shopping concierge, and a few new storage containers were purchased from the dollar store to make sure I didn’t overstep her financial restrictions. The kitchen had two sets of cabinets with glass doors, which were currently being used for disposable products, like paper plates and plastic cups. We removed the items and replaced them with her cookbooks and vases, so they could be accessed easily. This also gave the glass cabinets a more aesthetically pleasing function! We carefully organized the items she wanted to keep, including her wide variety of spices. 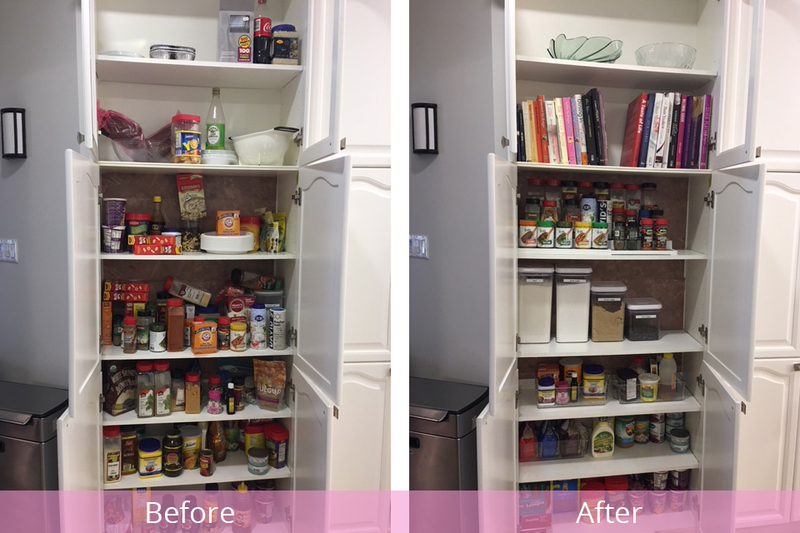 As her personal shopping assistant, I helped Susan to choose a spice rack that would suit the look and feel of her kitchen, as well as being easier to maintain. The kitchen was starting to come together, and I could already see a huge change in Susan’s attitude towards the space she once detested. Finally, we sorted through Susan’s collection of cleaning products that were dormant under the sink. 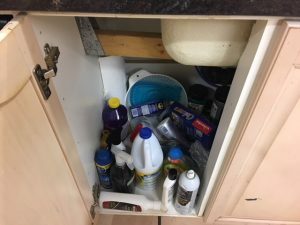 After discarding the empties and near-empties, we found new, more appropriate places for the lesser-used products, giving Susan more kitchen storage space for essential items, and ensuring she wouldn’t buy more of what she already had! We finished with 2 full boxes of items ready for donation, and a whopping 9 bags of garbage to be thrown out. My personal concierge services had made a big difference. The kitchen looked brand-new and almost totally unrecognizable from the cluttered, smelly and littered space I had first reviewed. Susan was absolutely thrilled with the results; she finally had the dream kitchen she deserved. 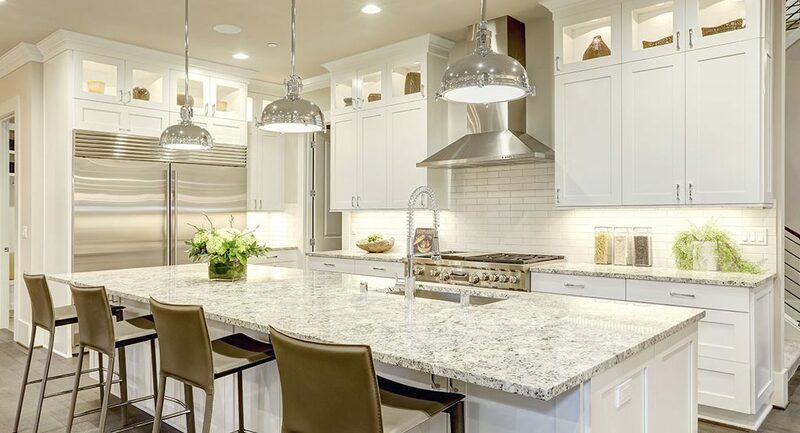 To find out about how you can maximize your living space and create a fresher, less cluttered environment with my home organizing, home maintenance and personal shopping services, contact me today. Say goodbye to chores, pressures and burdens, and hello to less stress and more time for you. Savvy Concierge - Simplify your life.